Rugged powertrain options, bold style, and advanced technology are some of the highlighting features of the 2018 Dodge Durango. With available seating for seven, ample storage and an optional rear seat entertainment system, you can count on the Durango to transport your whole family in comfort, and aggressive outer appearance and impressive engine power make it a standout among family vehicles.Muscle car and race enthusiasts will love the special SRT model, built with top-notch-performance in mind and featuring an exclusive engine. So is the 2018 Dodge Durango for you? Read on to find out. What are the components of the 2018 Durango's powertrain? Standard powertrain for the 2018 Durango is driven by a trusted 3.6-liter Pentastar V6, which puts out 290 horsepower and 260 pound-feet of torque. Those looking for some extra power, however, can opt for the upgraded 5.7-liter HEMI V8. This engine puts out 360 horsepower and 390 pound-feet of torque, and has a class-leading towing capacity of up to 7,400 pounds. Both of these engines are mated to a capable eight-speed automatic transmission, and standard rear-wheel-drive. Two all-wheel-drive systems are also available for even greater handling and traction. 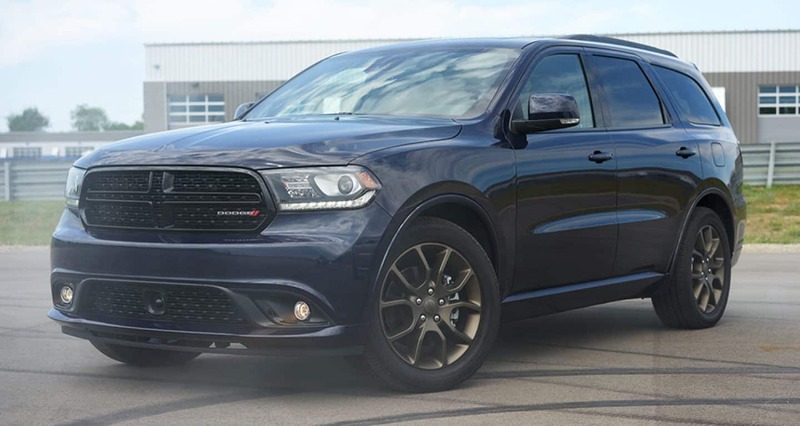 For those seeking even more engine power and all-around attitude, the all-new Durango SRT features an incredible 392-cubic-inch HEMI V8 engine with 475 horsepower and 470 pound-feet of torque. 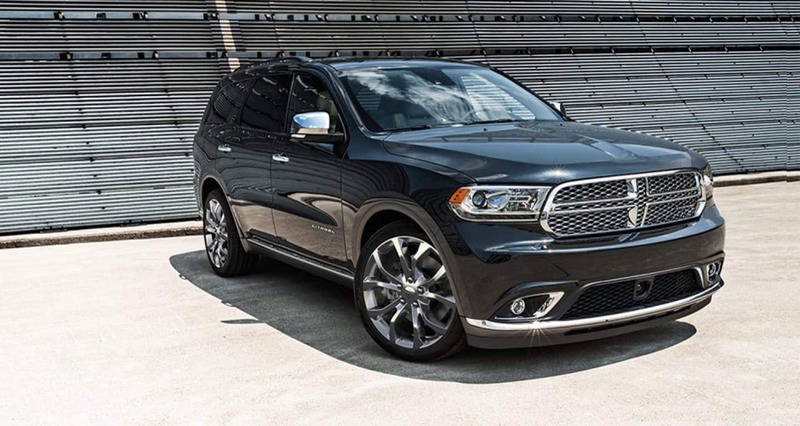 The SRT engine maxes out the Durango's performance in many areas, including speed, acceleration and tow capacity. What is the 2018 Dodge Durango's design like? 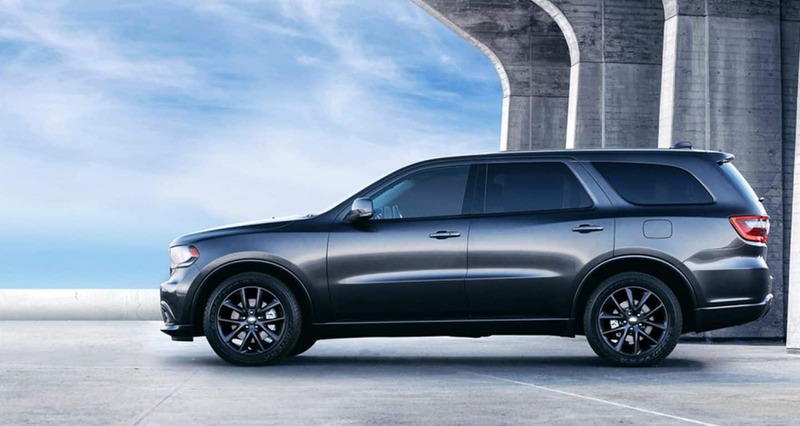 The Durango's design is perfect for a large family with a bit of attitude. Three-row seating provides ample seating for seven, while available second-row captain's chairs reduce overall capacity to six but provide enhanced comfort and easy access to the 50/50-split fold-flat third-row bench seat. 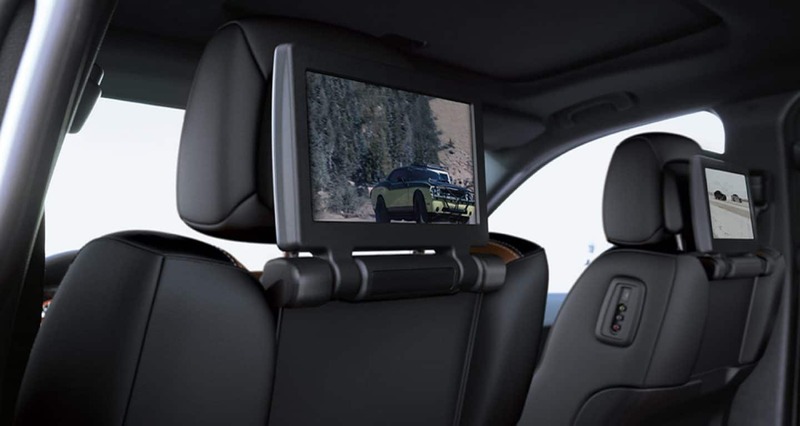 An available rear entertainment system with Blu-ray, DVD, HDMI and RCA capabilities make the back of the Durango and even more welcoming place for families, with included wireless headphones and remote. Up front, driver and front passenger will enjoy a standard 7-inch touchscreen infotainment interface, or an upgraded 8.4-inch screen. While the Durango's interior is a welcoming family environment, the suv's exterior provides attitude and style that you may not find from your typical family vehicle. A bold, aggressive exterior design echoes that of classic Dodge muscle cars, with muscular lines, an iconic Dodge split-crosshair grille, and an aggressive front fascia. Other available exterior features include a gloss-black grille, black wheels, running boards, chrome exterior details, a sunroof, and roof rails with crossbars. What is the new Durango SRT? All-new for 2018 is the Durango SRT, a performance-inspired powerhouse of an SUV with Street and Race Technology design. Powered by a show-stopping HEMI V8 with 475 hp and 470 lb-ft of torque, the SRT earns the title of quickest and most powerful three-row SUV in the world. With a 4.4-second zero to sixty acceleration, the Durango SRT is a truly race-ready vehicle, and achieves a National Hot Rod Association-certified quarter-mile lap time of a mere 12.9 seconds. The SRT's engine also maxes out the Durango's towing capacity at a class-leading 8,600 pounds. 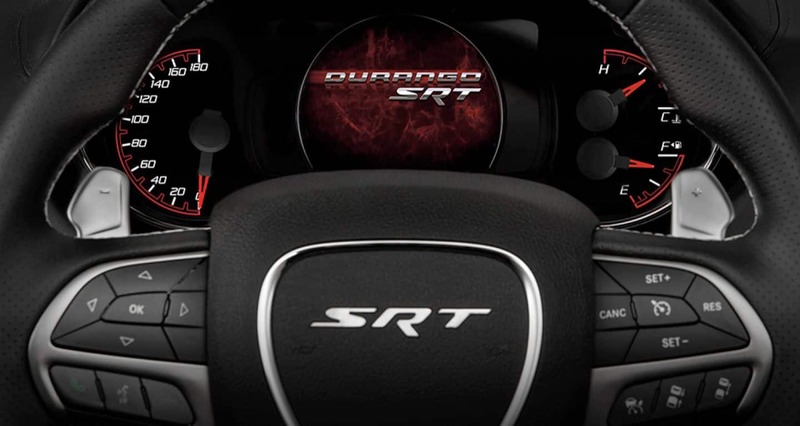 To match its incredible engine power, the SRT features a race-inspired design inside and out. 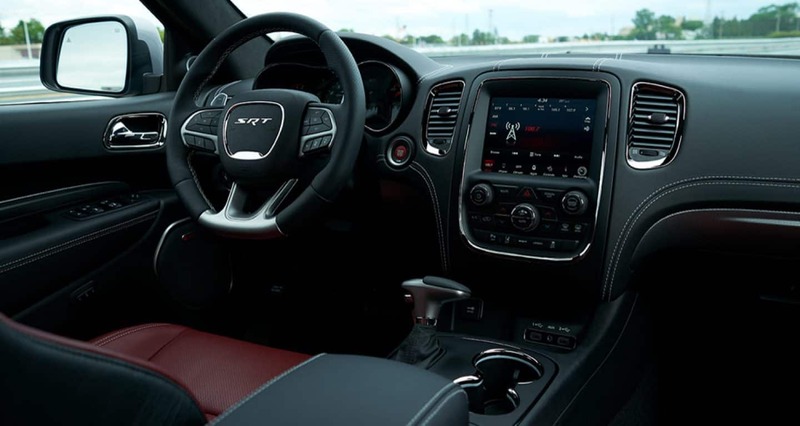 A center hood air inlet duct and low front fascia adds to the SRT's sporty exterior appearance, and a standard leather and suede interior gives a feeling of luxury. Many of the highest-quality features available with the regular Durango's top R/T trim come standard with the SRT. Those looking for a capable family vehicle with some extra style should look no further than the 2018 Dodge Durango. Available features like second-row captain's chairs, fold-flat seating, and a rear entertainment system make the Durango a perfect option for large families, while the vehicle's capable powertrain and aggressive exterior give it a kind of swagger that you won't find in a minivan or station wagon. Check out one of the many 2018 Dodge Durangos here on our lot today and see if this suv is the vehicle for you.